Short pauses between groups of long notes and slur exercises will help your lips feel fresh and build embouchure strength! Long tones played too loudly will result in lip fatigue and will also break down the muscle you are striving to build! NEVER FORCE THE TONE! Too much mouthpiece pressure will also tire your lips and break down what you are trying to build! Remember that your goal is to develop a good strong tone and lip endurance so you can last longer an maintain lip accuracy. If you are feeling pain where the lips are in contact with the mouthpiece rim, then that should be a reminder that you are pressing TOO HARD! When slurring from one partial to the next, depend more on moving the air column more rapidly in coordination with the contraction of the lips. DON’T LET THE LIPS DO ALL THE WORK! Speed of air helps to make the slur easy. Know on which partial you are going to start – is it low C, middle G, or middle C DO NOT MERELY PLAY BY FEEL! Listen for the note before you begin to play. This will increase your chance of hitting the note. Get the sensation of a good yawn before playing the note. When the throat feels free and open, the tone is rich and vibrant. Always go back to that yawning sensation when your throat starts to feel tense or squeezed. You must remind yourself of this constantly until it becomes a natural reflex, which it will become through good practice habits. George Rabbai has been a Civil War reenactor since 1990. He serves as bugler for the Mifflin Guard and his bugling can be heard in the Kevin Hershberger films Wicked Spring and The Last Goodbye. 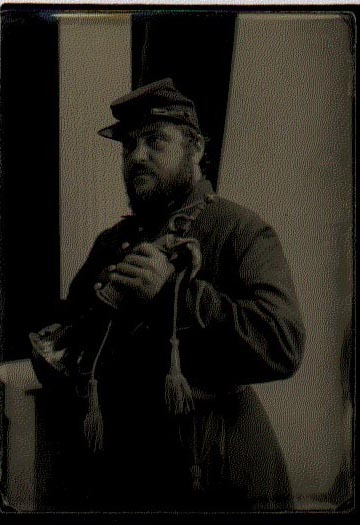 George can also be heard and seen in the film at the Harrisburg Civil War museum. George's lyrical trumpet sound is featured in the soundtrack of Baseball, a film by Ken Burns, which first aired nationally on PBS in 1994, as well as in Burns' epic documentary The West. His book Infantry Bugle Calls of the American Civil War is the standard by which all bugling in the hobby is set. An active jazz performer and educator, he is currently on the faculties of Philadelphia's University of the Arts and The Maynard Ferguson Institute of Jazz at Rowan University in Glassboro New Jersey. He makes frequent appearances at area schools as a jazz clinician, festival adjudicator and featured artist. This entry was posted on Monday, May 31st, 2010 at 2:20 pm	and is filed under Getting Started on the Bugle. You can follow any responses to this entry through the RSS 2.0 feed. Responses are currently closed, but you can trackback from your own site.